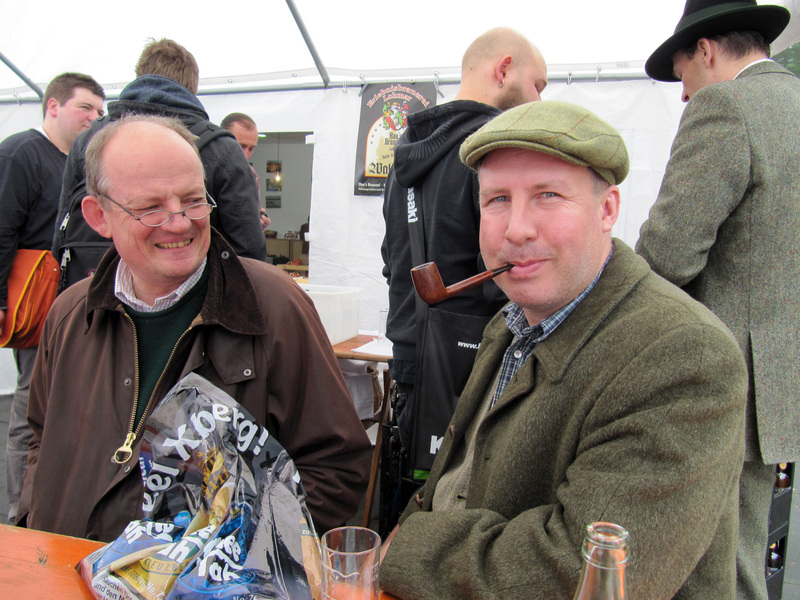 Last year when all the business with the forum tobaccos had been taken care off German master-blender Hans Wiedemann of HU Tobacco asked if I was coming to the next Lohmar Pfeifenmesse (Lohmar pipe-show). We then finally would be able to shake hands after the loads of mail-contact we had. Hans lives in the South of Germany which is far away from where I live in The Netherlands and according to him the Lohmar pipe-show was the closest to my home. I looked it up and indeed Hans was correct, it was a 230 km. ride for me. 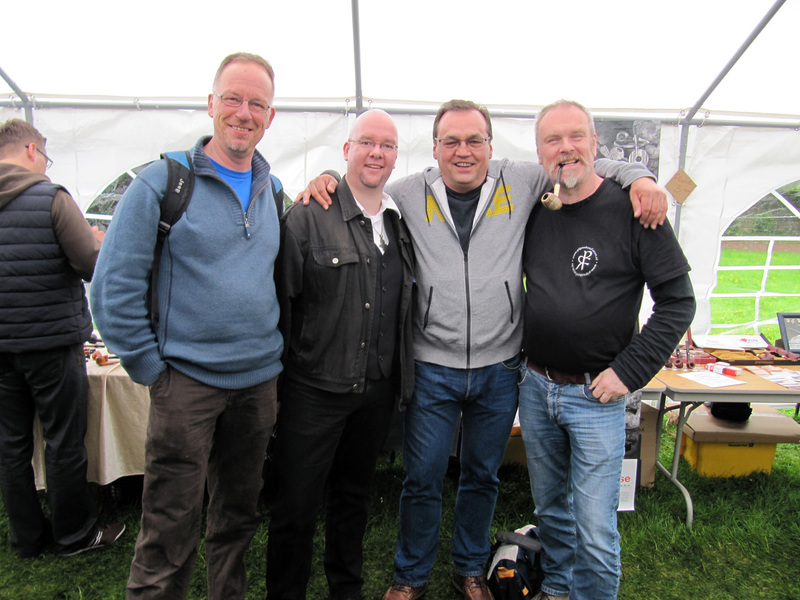 He also asked me if I could promote the pipe-show a bit on the Dutch/Belgian pipe-smokers forum, which I of course did. At first there was not much response so I decided to ask if fellow forum-member Robbie-San (real name Rob but there are more Robs in this story) was willing to go to Lohmar with me. We had met before at several meetings and I knew he was a good guy and pleasant company. In the end another forum-member, Smoking-Rob (behold, the other Rob), asked if he could join us. Of course, the more the merrier! Also a couple of other forum-members said they would come. 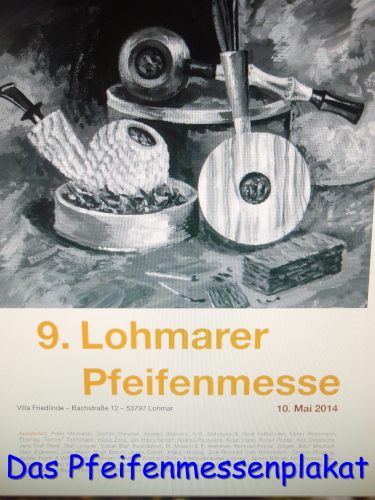 It was going to be the 9th edition of the Lohmar pipe-show organized by pipe-maker Volker Bier and his friend Jürgen Hofer. 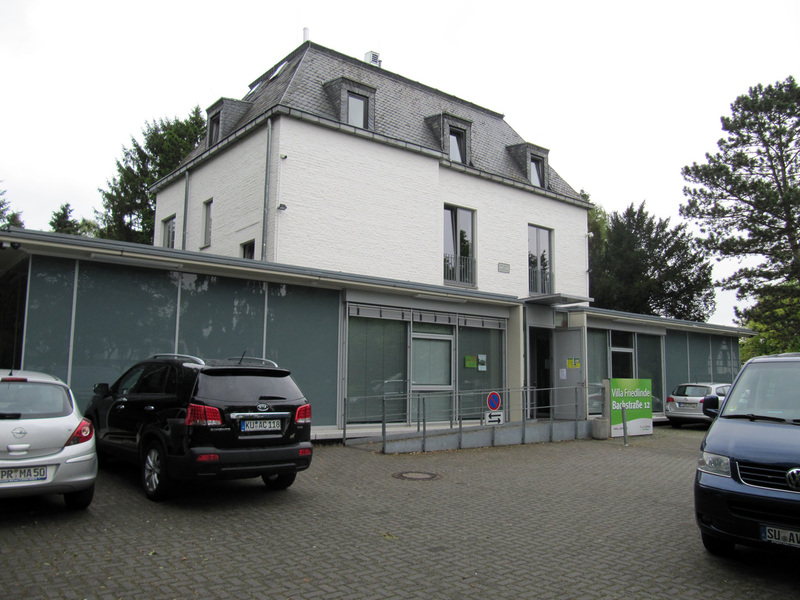 The location is the same every time: Villa Friedlinde in the heart of Lohmar. This year a large section of the surrounding park also was part of the show. To my delight I read in the announcements on a German forum that Volker closely works together with the local authorities who are proud to host the event. Even the site of Lohmar-town promotes the pipe-show. I mean, these days here in The Netherlands you won’t easily see towns supporting a smoking-event. In fact, we don’t have smoking-events any more..
Yess, the Force was with us! After a few messages back and forth Robbie-San and I decided that he would drive to Germany. He has a car that runs on diesel and that is cheaper. We’re Dutch remember? But that meant I had to come to Brabant first because Robbie-San lives there. No problem, I work there every last half of the week and have an address where I can spend the night. Saturday 10 May at 08.30 sharp Robbie-San rang the doorbell. I grabbed my belongings including some cheese-sandwiches that I made for the road. 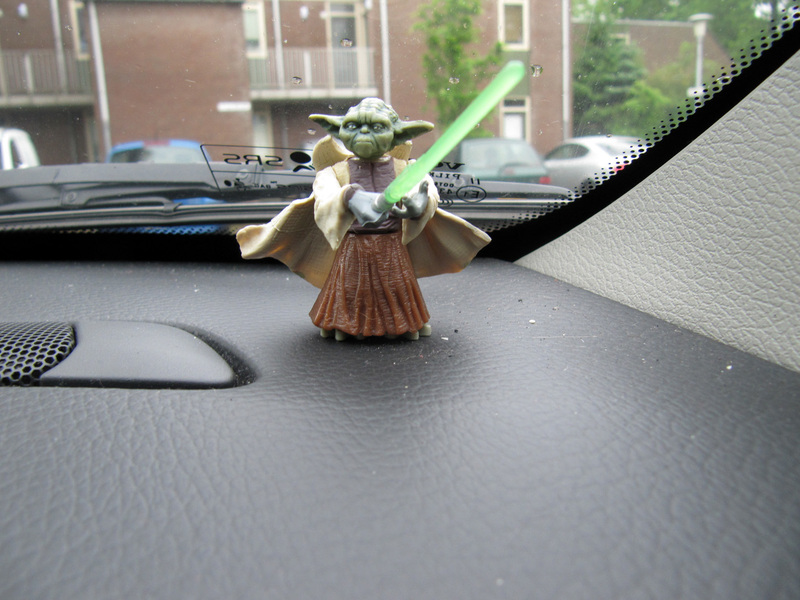 I had to laugh when I stepped into the car because on the corner of the dashboard stood a miniature Yoda. So the Force was going to be with us! We drove to somewhere along the edge of the city of Nijmegen where Smoking-Rob was waiting for us. After the handshakes he presented a tin of MacBaren HH Old Dark Fired to Robbie-San as a thank-you for driving. For me he had a tin of vintage (1980’s) Capstan Medium Navy Cut that I traded with him for some Janneman Flake. “Arno, quickly come with me” he said “I have seen a gorgeous estate Dunhill!” So he literally dragged me through the masses in Villa Friedlinde to an outside tent in which a vendor had displayed numerous estate pipes. First my eye fell upon a good looking Dunhill shell prince but that was not the one André meant. 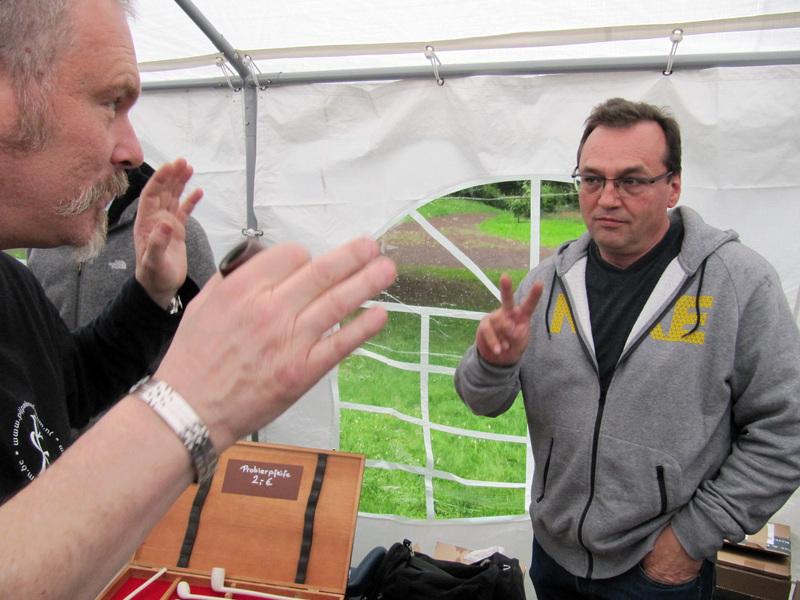 “No no, here, this cherrywood shape, look at this one! See the blast and how crisp it still looks?” I could not argue with him and felt the Force was with me! Although it was not a patent-era Dunhill the pipe (birth-year 1976) was stunning and the price was ok. My godfather had given me some money for my birthday so I was able to buy it. Sadly I did not have enough cash to also buy the Dunhill prince, other things also had to be purchased. Before going back inside we went to the farthest tent where Hans Wiedemann should be. Should, yes, he was just taking a smoke outside the narrowness of the tent. We politely waited until he got back and in the meanwhile admired his tobacco-range on the table. He had three new blends: Red Sparkle, White Dog and an unique blend, Fayyum Kake. The first cake to come from German soil as far as I know. Hans has invested in a tobacco press at his home and this is the first creation to come from it. He had a bar of the blend laying on the table so I decided to slice off a piece and put it in my new Meindert prince. I looked around and decided to walk around the tent. I noticed it was BUSY, people stood shoulder to shoulder but no pushing or things like that. Everybody was really polite. 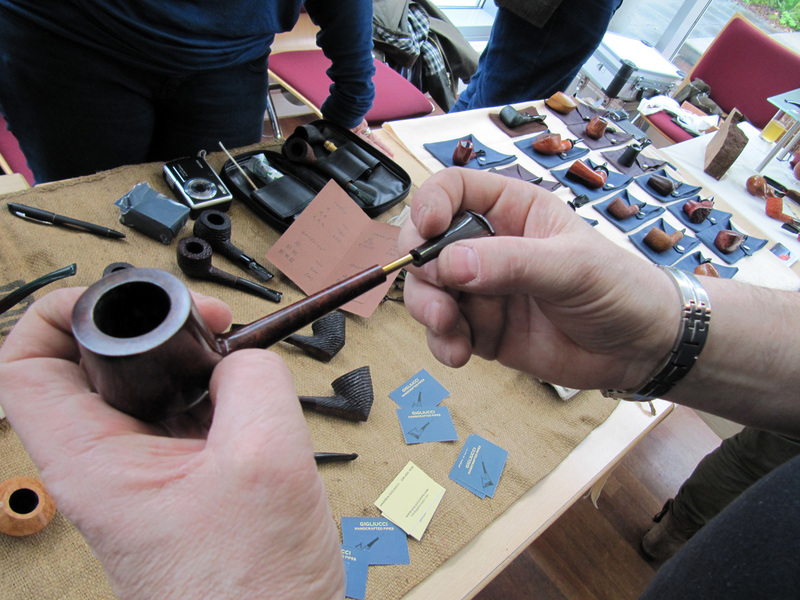 I admired several pipes and snapped pictures of them and their makers. Germany is a big country but it still surprises me how many pipe-makers it has. And also female pipe-makers! 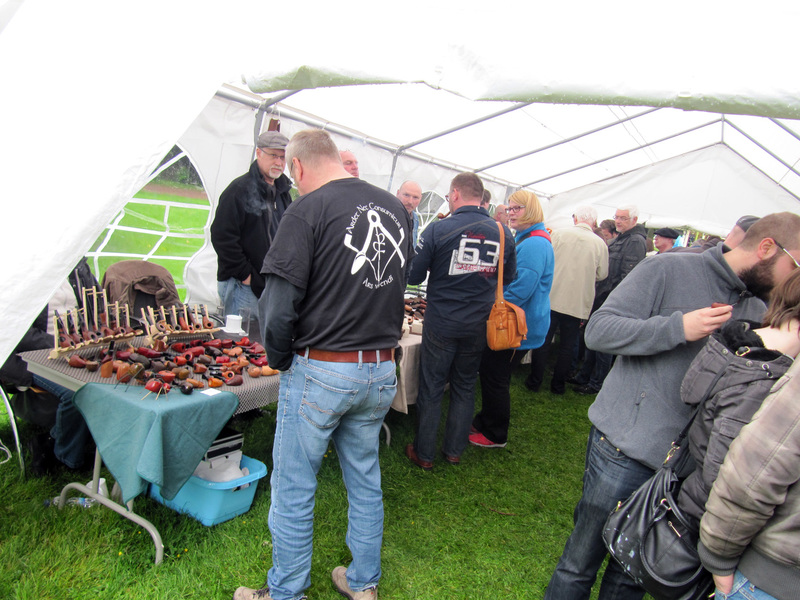 Behind one of the tables sat a shy looking short haired woman: Maike from Maike pipes. When I asked if I could pick up and admire a couple of her pipes she even shrank back more behind her table. No need because what she makes is beautiful. To my delight, when I came back later, I saw that she had sold some of her pipes. When Hans came back we were finally able to shake hands. It was a real pleasure to talk to him in person after all our mutual correspondence. Unfortunately it was busy so we we had to keep the conversation short. I also wanted to buy a couple of tobaccos including his excellent Sunset flake. When I pulled my wallet he asked a lower price for the tins, “because it is you”. Well, thanks Hans! “Come back later when it is more quiet, we talk more then” he said. Check! So Robbie-San, Smoking-Rob and myself walked back towards the villa. Just behind the villa was a tent which included a beer-stand from a local brewery. We were all feeling like having a nice cold German beer so we asked the voluptuous woman behind the bar what our choices were. Dark beer and bright beer was the answer. The two Robs took the bright beer and I the dark one ( I love dark beer). De-licious! We had to laugh with the friendly lady because for some reason she thought we were from England and spoke German so well. Robbie-San played his English gentleman role perfectly. After the beer we went inside the villa and almost immediately bumped into fellow forum-member Robert Jan who was anxious to see the displayed wares. Loads of pipe-makers were lined up beside each other and we shuffled from table to table admiring the handicrafts. We stopped at the table of a man who made the shanks of a lot of his pipes very thin. That is not possible I thought, the shank would be very delicate and prone to breakage. It turned out that the carver, Andrea Gigliucci from Italy, made a system with an metal rod inside the shank to give it strength. I saw a pot-shaped pipe of him which with a little tweaking would make a formidable prince. In English with a thick Italian accent he told me that he had never tried to make a prince-shaped pipe. I hope I can give him the order someday! We also passed the table of a pipe-maker who seemed to have specialized himself in the making of short stubby pipes: Holger Gunia. 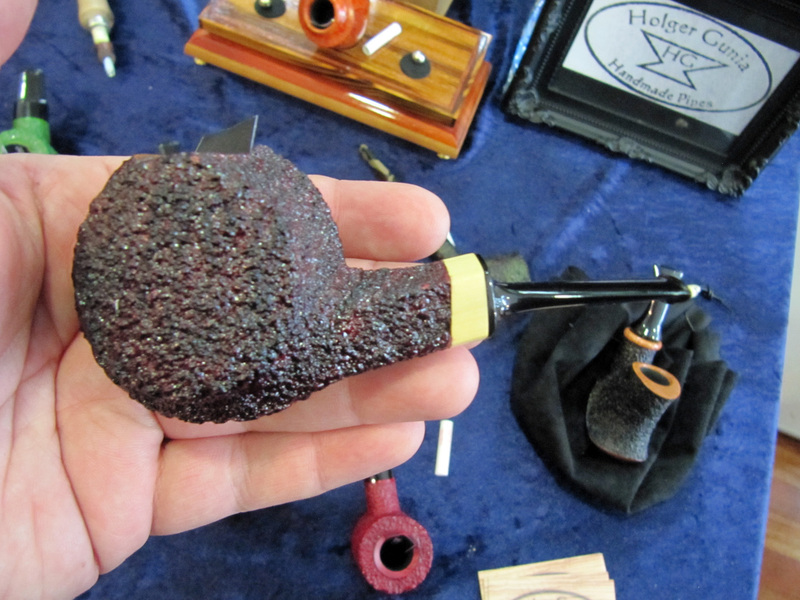 I immediately had to think of another fellow forum member, Huub, who has a vast collection of this type of pipe. I myself am not a fan of these shapes but I surely could appreciate the handicraft and especially the rustication of some pipes which almost seemed to sparkle, very strange but very nicely done. Inside the villa there also was a kitchen which served food and beverages for little money. We all were a bit hungry so decided to go for some typical German food, Bockwurst, which tasted delicious. A must-try when you visit Germany. Outside in one of tents there was a table on which all kinds of leather goods were for sale. All 100% handmade in Germany and unique. Robbie-San saw a stunning bracelet which he had to have. Very un-Dutchlike he did not haggle when he heard the price. 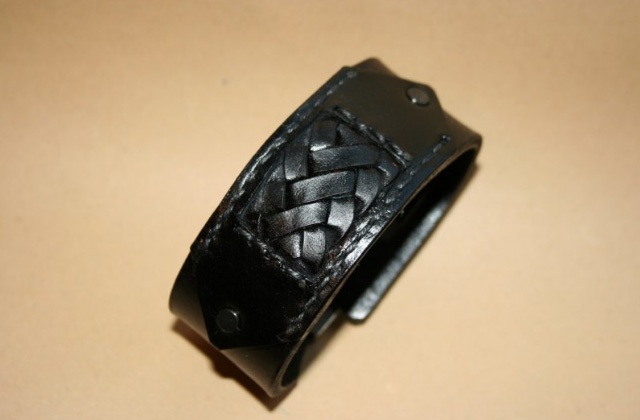 “I know all the handicraft in the bracelet is worth the money” he said. I wanted to buy something for my girlfriend Ellen so I opted for a dark blue bracelet. You know, I believe that a man has to keep his woman content. If I come home with an expensive (in her eyes) pipe her mood will be much better when she is given a nice present. Robbie-San and I wanted to drink something hot (all the rain did not exactly make us feel any warmer) so I got a coffee and he a cup of tea. We sat down at a large table where some Germans already had taken place. I looked at the pipes of one the men, nothing special, but then saw a tobacco I did not know yet, Exclusiv Royal. I asked if I may have a look and the tin was given to me. I looked at it and smelled it, yummie! A granulated cut, interesting. Robbie-San was given permission to fill a pipe with the blend so I pulled out a tin of McClelland Pebblecut and asked if the German gentlemen knew it. They had never seen an American tobacco before and happily filled up a sample bag with it. I wonder what they thought of it when they eventually smoked it. After the hot beverages we went back to Hans because Robbie-San had to get some tobacco samples for another forum member. Smoking-Rob was sitting outside the tent and talking to Rainer, the “little finger” (helper) of Hans. Inside Robbie-San could fill up his sample-bags the blends of Hans while I further talked to the master-blender. I asked him if he had any new projects and he told me he was, amongst other things, working on an oriental-heavy mixture. Interesting! I hope I get a sample of it before it comes out. He also complimented me with this blog and was a bit shocked at how much viewers I had so far, about 90.000. Hell, I am also shocked at how many people read my humble writings. Hans then got momentarily busy with a client who ended up with a gigantic bag full of tobacco tins. He told me that he only buys tobacco once a year, at the Lohmar pipe-show and all blends of HU Tobacco. Impressive! To my utter delight I also saw a tin of Brullende Leeuw in his bag. The forum tobaccos were selling well, Hans told me. When Smoking-Rob once again joined us we did make a group picture with Hans. Smile! And after that it was time to go home. We comprehensively thanked Hans for the time he took for us and walked to the car. 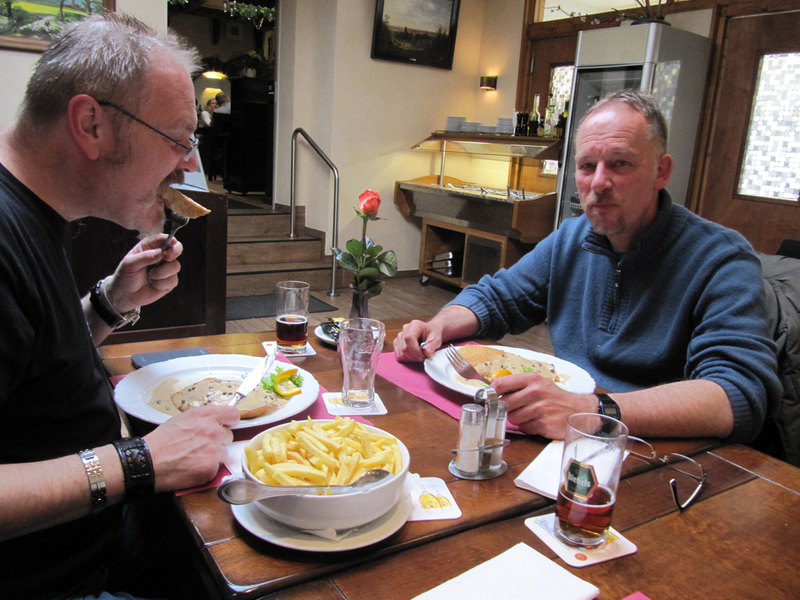 On the way home we decided that we would have dinner in Kleve, near the Dutch border. Unfortunately before we got there Robbie-San was flashed by a speed-trap camera, I hope for him that the fine is not too high.. 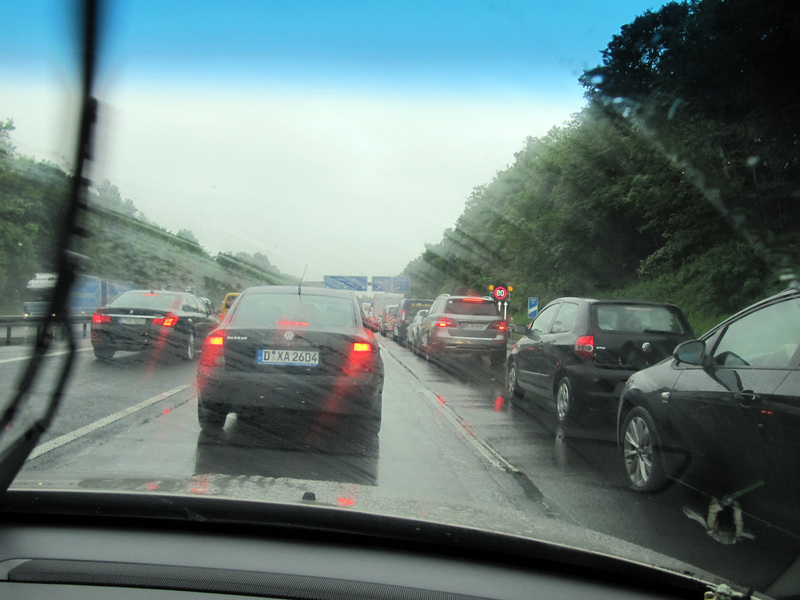 When we arrived in Kleve it was raining cats and dogs. We got out of the car, went looking for a place to eat, could not find one, got soaking wet and went back inside the vehicle. We drove to another part of the centre and passed a decent looking restaurant. There we all opted for another typical German (ok, typical Austrian..) dish, a Wiener Schnitzel. When, after a looong wait, the waiter finally brought the plates my Schnitzel was clearly smaller than the others to the amusement of the Robs. What, did I get less because of my fat looking head?? Hmzzzgrumble.. After dinner we drove back through the beautiful region of Nijmegen where I was born and said goodbye to Smoking-Rob. Robbie-San then dropped me at my sleeping address in Brabant, we shook hands and we thanked each other for the wonderful day. Once home I kissed Ellen, said I got her a beautiful, handmade and expensive present and gave the bracelet before pulling out the Dunhill. She shook her head while smiling at me.